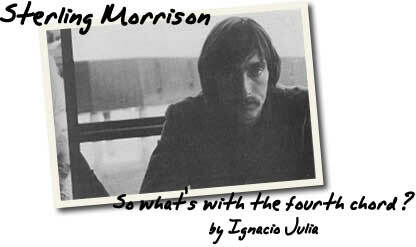 Sterling Morrison - So What's With The Fourth Chord ? I visited Holmes Sterling Morrison for the last time the summer of 1995, four weeks before his death. I took the train at Central Station and made the trip, bordering the Hudson River, to Poughkeepsie, where he had relocated from Texas to fight the illness with wife Martha, firstborn Mary Ann and little Tommy. My friend had been fighting for months in silence and didn’t look the same: just bones, no hair, extremely weakened, mentally trapped. Dean Wareham had frequently visited him, not John Cale or Lou Reed, who would say goodbye to him days before the unhappy ending on August 30, a day after his 53rd birthday. He was glad to see me, and came down from his room for a couple of hours, until his strength vanished. While Martha cooked lunch we talked about the illness - he was very aware it was a crucial last assault -, about music and about the trivial daily things that tie a dying man with the life that escapes him. Motivated by my presence, he decided to check an advance cassette from the forthcoming Peel Slowly And See box set, the newly discovered acoustic demos from 1965, recorded with Lou and John at Ludlow Street. It was the first time in thirty years he heard them, I myself had never known even of their existence. He concentrated on listening like a very old man oblivious of his physical decay would do; he seemed very interested in what we were hearing, fragments of a youth now definitively left behind. I felt a paralyzing emotion, by what I was listening to - a sketch for Venus in furs sung by John as an ancient folk ballad -, and by the broken weakness of who had left me behind, a beer in hand and endless conversation on the lips, in more than one shared race to dawn. Suddenly he said: "Hmmm… funny!". What is funny, Sterling?, I asked. "That I like it...". He was like that, standing tall till the end. Sterling will be remembered for belonging to one of the most influential bands of the sixties, The Velvet Underground, perennial icon whose effects seem dormant today, after its generational reappraisal during the nineties. His favorite song was precisely Venus in furs: he used to say they had achieved in it, like in no other track, the sound they had in mind. Those who enjoyed his friendship will remember him as an extraordinary character: open, combative, brilliant, athletic, contradictory, but above all human. A womaniser who never fully left his wife and kids, a gigantic beer drinker, a compulsive antagonist and the unstable element at any meeting. The Velvet Warrior, as in the heartfelt requiem wrote by his old college friend Lou Reed, with whom he maintained a quiet war during two decades. Nevertheless, even after the total vindication of the band he helped build, Sterling remains unsung as a guitar player. And he was most responsible for that situation. As a severe believer in the sixties ethic that values the whole of a band above its soloists, he simply wanted to be in his place, inhabit a secondary role, contribute to the general sound. He knew how to counteract the neurotic guitar player Reed with chords furious or gentle, following the teachings of his idol Steve Cropper, the golden rule dictating that a good riff is worth a hundred solos. He was also a brilliant soloist, extremely delicate or metronomic - the five and a half minutes of catatonic country that thread Pale blue eyes, or the schizophrenic duplicity with Lou, channel against channel, in Some kinda love, both on the third album The Velvet Underground -, gladly rock in the more vital and classic sense - like in the circular, passionate solo for the revisited Rock 'n' roll they performed during the 1993 reunion tour -, always painfully given to the foundation and embellishment of the song, never rising above it. They say his obsession was the opposite to most guitar players: he turned down the amplifier’s volume in order to be below his colleagues. And when the chance to show his talents finally came during the reunion tour, he only executed two solos in shows lasting more than two hours! In those concerts we discovered he also played bass; he had shared it with Cale on the first two albums. Music had been for him one of the many adventures that inform the living experience, and he had the luck of devoting himself to music in the most creative of decades, the sixties, when everything was still to be invented and rules could truly be broken. His scholarly interest in middleage Anglo Saxon poetry - a place as a teacher at the university of Texas in Austin that he left for a well paid job working on tugboats in Houston - and his passion for life itself, kept music at an afterthought level when he decided to quit for good. When he finally returned to the world he had abandoned in 1971, loathing the malice of managers, promoters and record executives, cancer took him in a year and a half with no chance for him of broadening his talents beyond what was already known. As a brief legacy we have, apart from the bulk of The Velvet Underground catalogue, a bunch of sessions for Moe Tucker - on the albums I Spent A Week There The Other Night (1991) and Dogs Under Stress (1994), on the later he played electric sitar -, his participation with Cale and Tucker in a first performance of new music for the Andy Warhol films Eat/Kiss; the recording with the same of the sadly prophetic People who died, a Jim Carroll cover, for the Spanish movie Antartida; and his definitive testament: the phenomenal solo activating Friendly advice, a Luna song available on their album Bewitched (1994). In this far reaching, electric eruption Sterling wholly survives: fiery, stylish, brave, sharp, never pretentious, infinitely exciting. As he was in the flesh: a saint and a sinner, sarcastic but an enthusiast, politically radical and egocentric, an inquisitive mind, fastidiously perfeccionist. Curious that the four original members of The Velvet Underground still shared the same stubborn attitude, of them against the world -and finally they against each other-, long after the disappearance of that quintassentially New York band that never surrendered to external pressures. When his denied brother wrote Sweet Jane and premiered it to him, in a hotel room while on tour, Sterling's first reaction was the usual in him, to answer a question with another. "So what's with the fourth chord, Lou?". You need guts. Special thanks to Ignacio Julia.